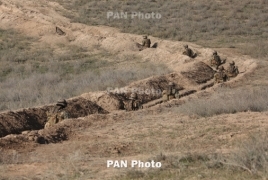 PanARMENIAN.Net - More than 220 ceasefire violations by Azerbaijani forces were registered on the contact line with Nagorno Karabakh (Artsakh) over the week of August 13 and 19, Artsakh's Defense Army said in a statement. Azeri troops, in particular, fired some 3300 shots towards the Armenian positions. The Karabakh frontline units refrained from retaliating to continue controlling the situation on the contact line and protecting their positions.